Wednesday Dad and I planned how to celebrate Valentine's Day on the actual day, but Mom had forgotten to tell us she was going out of town that evening. Thus, we celebrated it a day late tonight. 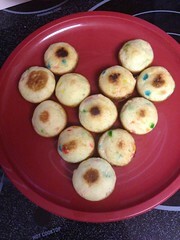 My plan was to make a heart shaped cake with cupcakes as Mom thought that was cool when we were in Target the other day. Since the kitchen is only partially unpacked I had to improvise a little in how I made it. 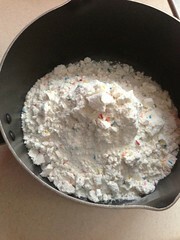 For one, we had no mixing bowls unpacked when I was mixing up the batter, so I ended up using a pot. Of course, the one box I unpacked while the cupcakes were baking was the one with some of the mixing bowls! Secondly, we have not found the pans, so I could not make regular sized cupcakes. What I had unpacked already, though, was my mini cupcake maker, which ended up being a better way of making them anyways. However, it took forever to use up all the batter (about 8 batches at 8 minutes each). 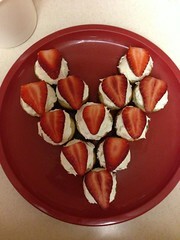 I topped the cupcakes with cream cheese frosting and strawberries after arranging them in a heart shape. The first night in our new house I ended up repeating the experience of when we moved into our first house when I was 1. At that time we moved from a two bedroom condo to a one story house with what I remember being four bedrooms and 3 living rooms. It was basically really huge and when we first moved in I would wander around unable to find my mommy and daddy. Over 20 years later moving back into the same house with my both parents for the first time in over 5 years, I ended up doing the same thing. It is not that the place is huge (my room is huge compared to my old one, but the house overall is not). However, I asked Mom where Dad was and then went to find him outside playing what I call musical cars because you have to park the cars just so to fit them all in the driveway. Then I went in to tell Mom I found Dad only to end up going in circles trying to find her. Thus, it is easy to wander in circles with the way the main path through the house is basically a circle. In fact, you can do a whole circle route if you go out on of the doors to my room and then go in the front door. Funny enough that is actually the shortest route from my room to half of the house including the bathroom.